The server that this website runs on backs up automatically to the Simple Storage Service, provided by Amazon Web Services. Such an arrangement is actually fairly cheap - only ~20p/month! I realised recently that although I've blogged about duplicity before (where I discussed using an external hard drive), I never covered how I fully automate the process here on starbeamrainbowlabs.com. It's fairly similar in structure to the way it works backing up to an external hard drive - just with a few different components here and there, as the script that drives this is actually older than the one that backs up to an external hard drive. To start, we'll need an AWS S3 bucket. I'm not going to cover how to do this here, as the AWS interface keeps changing, and this guide will likely become outdated quickly. Instead, the AWS S3 documentation has an official guide on how to create one. Make sure it's private, as you don't want anyone getting a hold of your backups! The PASSPHRASE here should be a long and unintelligible string of random characters, and will encrypt your backups. Note that down somewhere safe too - preferably in your password manager or somewhere else at least as secure. This might look long and complicated, but it's mainly due to the large number of directories that I'm excluding from the backup. The key options here are --full-if-older-than 2M and --s3-use-ia, which specify I want a full backup to be done every 2 months and to use the infrequent access pricing tier to reduce costs. The other important bit here is to replace INSERT_BUCKET_NAME_HERE with the name of the S3 bucket that you created. Again, don't forget to replace INSERT_BUCKET_NAME_HERE with the name of your S3 bucket. Here, I specify I want all backups older than 4 months (the 4M bit) to be deleted. It's worth noting here that it may not actually be able to remove backups older than 4 months here, as it can only delete a full backup if there are not incremental backups that depend on it. To this end, you'll need to plan for potentially storing (and being charged for) an extra backup cycle's worth of data. In my case, that's an extra 2 months worth of data. That's the backup part of the script complete. If you want, you could finish up here and have a fully-working backup script. Personally, I want to know how much data is in my S3 bucket - so that I can get an idea as to how much I'll be charged when the bill comes through - and also so that I can see if anything's going wrong. Done in 0h 12m 51s. Awesome! We've now got a script that backs up to AWS S3, deletes old backups, and tells us both how much space on S3 is being used and how long the whole process took. I'm including the entire script at the bottom of this post. I've changed it slightly to add a single variable for the bucket name - so there's only 1 place on line 9 (highlighted) you need to update there. echo [ $(date +%F%r) ] Performing backup. echo [ $(date +%F%r) ] Backup complete. Removing old volumes. echo [ $(date +%F%r) ] Cleanup complete. While I've got some grumblings with systemd over how it handles (or not) certain things, it's the most popular service manager on Linux systems today. By this, I mean it starts and stops the various services (like your SSH server, web server, cron) automatically, according to the rules laid out in special service files. Bear in mind that systemd isn't the only service manager out there. Others include OpenRC, runit, upstart, and more! If you're using one of these (I'm looking to investigate using one of these on my next server rebuild), then this tutorial isn't for you. I will probably be releasing a tutorial down the road for OpenRC though, if I get around to having a server running an OS that uses it. The above is a simple service file for Gitea, which is the engine behind my personal git server. Let's go through each section one by one. Firstly, the [Unit] section defines the metadata about the service. It's fairly self explanatory actually - we set the description of the service here, and also the other services (space ` separated) that we want our service to be started after with theAfter` property. Next comes the [Service] section. This section specifies how it should start the service. We tell it that it's a simple service (in other words it doesn't do anything fancy - other types are available, but we won't use them here), the user and group it should run under, and working directory of the process, and the command (and it's arguments) to execute in order to start the process. In addition, we also tell it to restart the service if it crashes, and set a few environment variables to refine the way Gitea behaves. Very cool! This starts our new service and configures it to automatically start when the system first boots. With that taken care of, we've now got the basics down of our very own service file! We can take this further though. What if there's a secret key that we need to pass to a service on startup in an environment variable, but we don't want to specify it in the service because it's world-readable? In this case, we've defined a service file for an XMPP bot (public server directory). In order for it to connect to an XMPP server, it needs a JID (a username - formatted like an email address) and password. However, we don't want to specify these directly in the service file because they are secret! This simple shell script loads the contents of the file .xmpp_credentials, specifies that the XMPP_JID and XMPP_PASSWORD environment variables should be passed to any further (sub) processes, and asks for the current process to be terminated and replaced with an instance of Mono executing our bot's code that stored in Bot.exe (this way we don't have an extra bash process sitting around doing nothing, since it's job is done as soon as we start the bot itself). Here the file permissions allow only the bot user to read and execute the file, but not modify it (sudo chown bot:bot .xmpp_credentials and sudo chmod 0500 .xmpp_credentials set these permissions for the curious). These completes the tutorial on setting up services with systemd. We've seen how to create service files and make them start on boot (much easier than alternatives like running a command manually or using screen!). We've also learnt a simple way to hide credentials (though more advanced alternatives do exist). Found this useful? Found a better way to do it? Comment below! You've probably heard of proxies. Perhaps you used one when you were at school to access a website you weren't supposed to. But did you know that there are multiple different types of proxies that are used for different things? For example, a reverse proxy perform load-balancing and caching for your web application? And that a transparent proxy can be used to filter the traffic of your internet connection without you knowing (well, almost)? In this post, I'll be explaining the difference between the different types of proxy I'm aware of, why you'd want one, and how to detect their presence. A reverse proxy is one that, when it receives a request, repeats it to an upstream server. For example, I use nginx to reverse-proxy PHP requests to a backend PHP-FPM instance. Reverse proxies also come in really handy if you want to run multiple, perhaps unrelated, servers on a single machine with a single IP address, as they can reverse proxy requests to the right place based on the requested subdomain. For example, on my server I not only serve my website (which in and of itself reverse-proxies PHP requests), but also serves my git server - which is a separate process listening on a different port behind my firewall. Caching is another key feature of reverse proxies that comes in dead useful if you're running a medium-high traffic website. Instead of forwarding every single request to your backend for processing, if you've got a blog, for instance, you could cache the responses to requests for the posts themselves and serve them directly from the reverse proxy, leaving the slower backend free to process comments that people make, for example. Both nginx and Varnish have support for this. This with method, it's possible to serve 1000s of requests a minute from a very modestly sized virtual machine (say, 512MB RAM, 1 CPU) if configured correctly. Take that, Apache! Finally, when 1 server isn't enough any more, your can get reverse proxies like nginx to act as a load balancer. In this scenario, there are multiple backend servers (probably running on different machines, with a fast internal LAN connecting them all), and a single front-facing load balancer sitting in front of them all distributing requests to the backend servers. nginx in particular can get very fancy with the logic here, should you need that kind of control. It can even monitor the health of the backend application servers, and avoid sending any requests to unresponsive servers - giving them time to recover from a crash. Forward proxies are distinctly different to reverse proxies, in that they make requests to the destination client wants to connect to on their behalf. Such a proxy can be instituted for many reasons. Sometimes, it's for security reasons - for example to ensure that all those connecting to a backend local network are authenticated (authentication with a forward proxy is done via a set of special Proxy- HTTP headers). Other times, it's to preserve data on limited and/or expensive internet connections. More often though, it's to censor and surveil the internet connection of the users on a network - and also to bypass such censoring. It is in this manner that HTTP(S) has become so pervasive - in that companies, institutions, (and, in rare cases), Internet Service Providers install forward proxies to censor the connections of their users - as such proxies usually only understand HTTP and HTTPS (clients request that a forward proxy retrieve something for them via a GET https://bobsrockets.net/ HTTP/1.1 request for example). If you're curious though, some forward proxies these days support the CONNECT HTTP method, allowing one to set up a TLS connection with another server (whether that be an HTTPS, SSH, SMTPS, or other protocol server). In addition, the SOCKS protocol now allows for arbitrary TCP connection to be proxied through as well. Forward proxies nearly always require some client-side configuration. If you've wondered what the proxy settings are in your operating system and web browser's settings - this is what they're for. Such can usually by identified by the Via and other headers that they attach to outgoing requests, as per RFC 2616. Online tools exist that exploit this - allowing you to detect whether such a proxy exists. Transparent proxies are similar to forward proxies, but do not require any client-side configuration. Instead, they utilise clever networking tricks to intercept network traffic being sent to and from the clients on a network. In this manner, they can cache responses, filter content, and protect the users from attacks without the client necessarily being aware of their existence. It is important to note here though that utilising a proxy is by no means a substitute for maintaining proper defences on your own computer, such as installing and configuring a firewall, ensuring your system has all the latest updates, and, if you're running windows, ensuring you have an antivirus program installing and running (Windows 10 comes with one automatically these days). Even though they don't usually attach the Via header (as they are supposed to), such proxies can usually be detected by cleverly designed tests that exploit their tendency to cache requests, thankfully. So there you have it. We've taken a look at Forward proxies, and the benefits (and drawbacks) they can provide to users. We've also investigated Transparent proxies, and how to detect them. Finally, we've looked at Reverse proxies and the advantages they can provide to enable you to scale and structure your next great web (and other protocol! Nginx supports all sorts of other protocols besides HTTP(S)) application. Recently, I took the time to add the official nginx ppa to my server to keep nginx up-to-date. In doing do, I jumped from a security-path-backported nginx 1.10 to version 1.14..... which adds a bunch of very cool new features. As soon as I leant that HTTP/2 Server Push was among the new features to be supported, I knew that I had to try it out. In short, Server Push is a new technology - part of HTTP/2.0 (it's here at last :D) - that allows you to send resources to the client before they even know they need them. This is done by enabling it in the web server, and then having the web application append a specially-formatted link header to outgoing requests - which tell the web server what resources it bundle along with the response. This enables link header parsing serve-wide. If you want to enable it for just a single virtual host, the http2_push_preload directive can be placed inside server blocks too. video - Videos to be played via the HTML5 <video /> element. The full list can be found here. If you don't have support in your web server yet (or can't modify HTTP headers) for whatever reason, never fear! There's still something you can do. HTML also supports a similar <link rel="preload" href="...." /> element that you can add to your document's <head>. While this won't cause your server to bundle extra resources with a response, it'll still tell the client to go off and fetch the specified resources in the background with a high priority. Obviously, this won't help much with external stylesheets and scripts (since simply being present in the document is enough to get the client to request them), but it could still be useful if you're lazily loading images, for example. In future projects, I'll certainly be looking out for opportunities to take advantage of HTTP/2.0 Server Push (probably starting with investigating options for Pepperminty Wiki). I've found the difference to be pretty extraordinary myself. Of course, this is hardly the only feature that HTTP/2 brings. If there's the demand, I may blog about other features and how they work too. Found this interesting? Confused about something? Using this yourself in a cool project? Comment below! 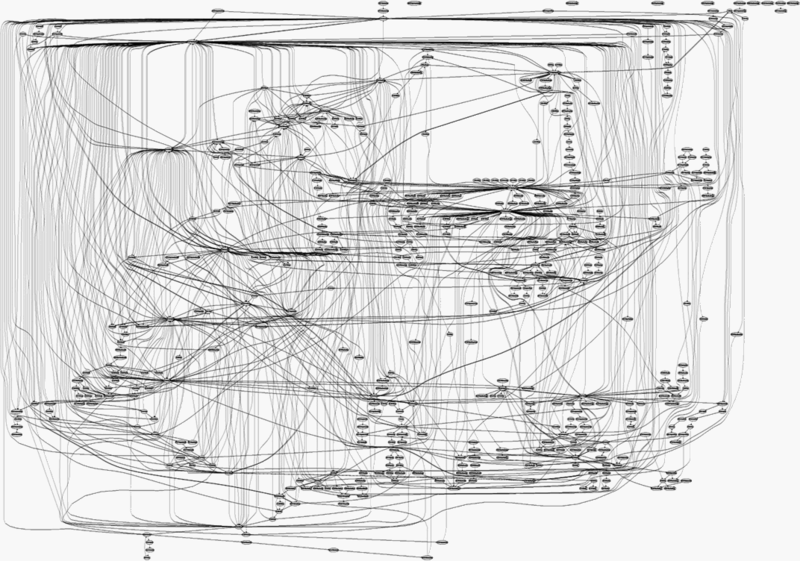 Scheduling jobs to happen at a later time on a Linux based machine can be somewhat confusing. Confused by 5 4 8-10/4 6/4 * baffled by 5 */4 * * *? All will be revealed! Scheduling jobs on a Linux machine can be done in several ways. Let's start with cron - the primary program that orchestrates the whole proceeding. Its name comes from the Greek word Chronos, which means time. 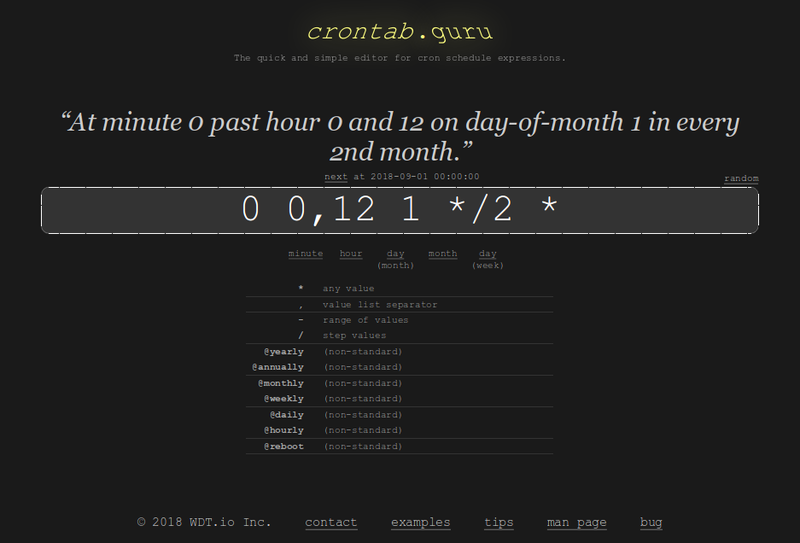 By filling in a crontab (read cron-table), you can tell it what to do when. It's essentially a time-table of jobs you'd like it to run. If it isn't installed or running, then you'll have to investigate why this isn't the case. The most common is that it isn't installed. It's normally in the official repositories for most distributions - on Debian-based system sudo apt install cron should suffice. Arch-based users may need to check to make sure that the system service is enabled and do so manually. I'd advise you keep this for future reference - just in case you find yourself in a pinch later - so scroll down to the bottom and start adding your jobs there. For of these values, a number of different specifiers can be used. For example, specifying an asterisk (*) will cause the job to run at every interval of that column - e.g. every minute or every hour. If you want to run something on every minute of the day (such as a logging or monitoring script), use * * * * *. Be aware of the system resources you can use up by doing that though! Specifying number will restrict it to a specific time in an interval. For example, 10 * * * * will run the job at 10 minutes past every hour, and 22 3 * * * will run a job at 03:22 in the morning every day (I find such times great for maintenance jobs). Sometimes, every hour or every minute is too often. Cron can handle this too! For example 3 */2 * * * will run a job at 3 minutes past every second hour. You can alter this at your leisure: The value after the forward slash (/) decides the interval (i.e. */3 would be every third, */15 would be every 15th, etc.). The last column, the day of the week, is an alternative to the day of the month column. It lets you specify, as you may assume, the day oft he week a job should run on. This can be specified in 2 way: With the numbers 0-6, or with 3-letter short codes such as MON or SAT. For example, 6 20 * * WED runs at 6 minutes past 8 in the evening on Wednesday, and 0 */4 * * 0 runs every 4th hour on a Sunday. The combinations are endless! Since it can be a bit confusing combining all the options to get what you want, crontab.guru is great for piecing cron-job specifications together. It describes your cron-job spec in plain English for you as you type! What if I turn my computer off? Ok, so cron is all very well, but what if you turn your machine off? Well, if cron isn't running at the time a job should be run, then it won't get executed. For those of us who don't leave their laptops on all the time, all is not lost! It's time to introduce the second piece of software at our disposal. Any executable scripts in this folder will be run at daily, weekly, and monthly intervals respectively by anacron, and it respects the hash-bang (that #! line at the beginning of the script) too! This is important, as anacron does not in itself run all the time like cron does (this behaviour is called a daemon in the Linux world) - it needs a helping hand to get it to run. The above job runs every 7 days, with an offset of 20 minutes. Note that I've included a command (the line starting with a hash #) to remind myself as to what the job does - I'd recommend you always include such a comment for your own reference - whether you're using cron, anacron, or otherwise. I'm not an administrator, can I still use this? 5 * * * *   /usr/sbin/anacron -t "path/to/anacrontab"
Good point. cron and anacron are great for repeating jobs, but what if you want to set up a one-off job to auto-disable your firewall before enabling it just in case you accidentally lock yourself out? Thankfully, there's even an answer for this use-case too: atd. In the above, I tell it to run the job 10 minutes from now, and enter a pair of commands. To end the command list, I hit CTRL + D on an empty line. The output of the job will be emailed to me automatically if I've got that set up (cron and anacron also do this). That just about concludes this whirlwind tour of job scheduling on Linux systems. We've looked at how to schedule jobs with cron, and how to ensure our jobs get run - even when the target machine isn't turned on all the time with anacron. We've also looked at one-time jobs with atd, and how to manage the job queue. As usual, this is a starting point - not an ending point! Job scheduling is just the beginning. From here, you can look at setting up automated backups. You could investigate setting up an email server, and how that integrates with cron. You can utilise cron to perform maintenance for your next great web (or other!) application. The possibilities are endless! Found this useful? Still confused? Comment below!